Goldman Sachs might still be able to sell a bad mortgage-backed security, but there'll be no more "sh**ty" deals. The Wall Street firm has told its employees that they can't use profanity in emails, text messages or instant messages anymore, not even ones with asterisks, The Wall Street Journal ($) reports Thursday. That's 34,000 traders, investment bankers and other employees suddenly seeing their arsenal of four- and five-letter words out of reach. The company will even screen the messages with computer programs to prevent ones that might slip by. The term "sh**ty deal," if you remember, provided the touchstone moment at an April Senate hearing featuring Goldman executives. 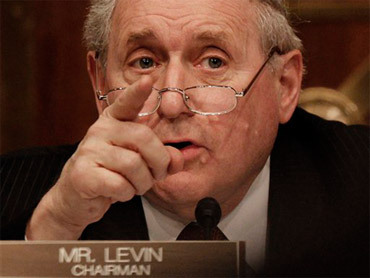 Sen. Carl Levin repeatedly - and to comically indignant effect - invoked the phrase in a memorable 10-minute period during which he questioned Daniel Sparks on whether the company was pushing a bad mortgage security called Timberwolf on clients. He quoted an email sent to Sparks, which read: "Boy, that Timberwolf was one sh**ty deal." Levin then asked: "How much of that shi**ty deal did you sell?" And "you didn't tell them that you thought this was a sh**ty deal?" And "should Goldman Sachs be trying to sell the sh**ty deal? Can you answer that one, yes or no?" There were even T-shirts made. No word on whether this applies to shorthand forms like "WTF."